Yesterday we reported that Los Angeles startup myStorey had teamed up with super star Memphis Grizzlies forward, Rudy Gay, for their new platform that “shopifies” the clothing and accessories he and other celebrities wear and use everyday. It seems with the changing of the guard and the sale of the team earlier this fall, that the Grizzlies are all about entrepreneurship, startups and cultivating downtown Memphis. Back in November, the Memphis Grizzlies were sold by Michael Heisley to a new group led by 34 year old telecommunications entrepreneur Robert J Pera. Pera had made the list of Forbes 10 youngest billionaires in the world after the company he founded in 2005, Ubiquiti networks, went public in October 2011. 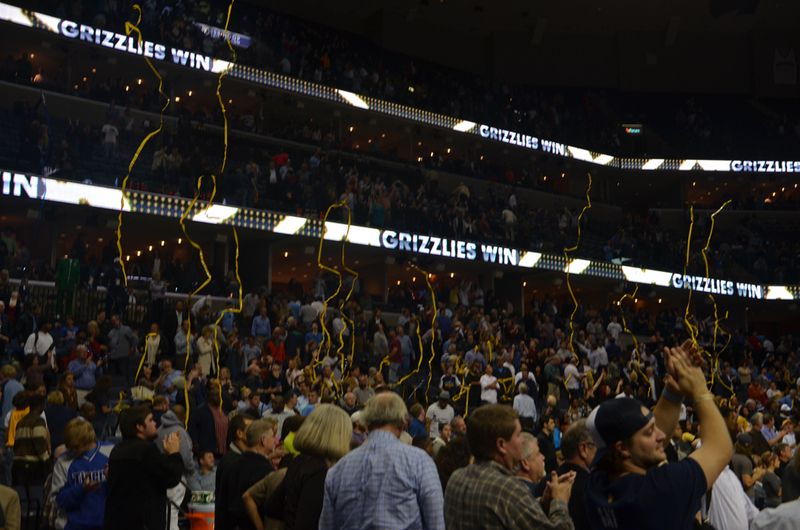 In Pera’s biography that appears in the Memphis Grizzlies programs this season, it says that it was a life long goal for Pera to be involved in professional sports which ultimately led to him leading the group that finally closed on the purchase of the Memphis Grizzlies, with NBA approval just two months ago. Justin Timberlake, Peyton Manning’s wife Ashley and basketball star Penny Hardaway are all minority stake holders in Pera’s group. The local Memphis part of the ownership group is more than just a group of local businessmen. Each one of the local team is an entrepreneur in their own right but they’ve also either embraced or are starting to embrace the local young entrepeneur and startup space as well. J.R. “Pitt” Hyde, is the founder of Autozone. He has one of the most robust careers of any single person. Hyde grew up in a family of entrepreneurs and immediately got involved with the family business Malone and Hyde. After taking over Malone and Hyde he ended up being the youngest CEO of any publicly traded company on the New York Stock Exchange. He was also the sitting CEO when Malone and Hyde was one of the first leveraged buyouts by notorious LBO firm KKR, prior to their infamous deal for RJR Nabisco chronicled in the movie and book Barbarians at the Gate. Hyde continued to build companies, including national auto parts chain AutoZone which is headquartered in Memphis. He also sits on the board of Memphis Bioworks, the medical device incubator that is the collaboration partner with Seed Hatchery in the Zeroto510 program. Hyde is also part of the Society of Entrepreneurs, an organization that supports local entrepreneurship, and he recently spoke at a New Memphis luncheon, where he moderated a panel with local startups PayTopia, Nanopthalmics and Bionanovations, all three of whom accelerated through Launch Memphis affiliated programs. Staley Cates is the President of Southeastern Asset Management. He was also instrumental in bringing the Memphis Grizzlies to Memphis from Vancouver. He sits on several boards that deal directly with youth including the board of the New Hope Christian Academy, Memphis Athletic Ministries, Soulsville and the Urban Youth Initiative. Also a member of the Society of Entrepreneurs Cates participates in mentoring young companies through the organizations “Core Conversations” program. Ed Dobbs helps lead the family business Dobbs Management Service which oversees interests in the automotive industry; restaurants and airline catering, beverage distribution and holding company Three Rivers Holdings. Dobbs is leading the family’s efforts to start and acquire new businesses. Dobbs also sits on the board of Memphis Fast Forward, an organization that fosters development, attraction and retention of talent in Memphis Shelby County. Duncan Williams, is the President of Duncan Williams a local investment bank. Duncan Williams is very active in the Memphis community. The company was also a signature sponsor for the Southeastern Medical Device Association Conference that was held in March in Atlanta. The organization highlights medical device entrepreneurship which is a growing funnel of new startup activity in the Memphis region and the southeast. Billy Orgel, is a Memphis communications Mogul. As the head of Tower Ventures a company that owns over 700 communications towers across the country and has sold another 280 more. Through the Society of Entrepreneurs, he too is active in fostering and mentoring young companies in Memphis. Orgel was also the angel investor that backed City Torch a Memphis location discovery startup that operated out of Emerge Memphis. But the Memphis Grizzlies ties to entrepreneurship don’t start or stop with their list of investors and even their player involvement in social startups. Many of the men listed here along with several others tied to the organization have noticed an emergence of more and more people coming to Memphis to go to school and staying post graduation to work for or start their own companies. They’ve also taken notice of companies and startups that have relocated to the Memphis area to grow their businesses. The entrepreneurial activity is bubbling to the degree that Memphis Grizzlies PA Announcer Rick Trotter made it a point to take notice of students staying in Memphis and the entrepreneurial activity spurring in the downtown area in a recent interview with local Memphis publication choose901.com. “One of my favorite things about being part of Memphis, right now is being a part of, a new culture, a new sense of optimism in this city…” He continues “I see a lot of hopeful folks, a lot of people with fresh ideas, and creativity coming to this city, people going to colleges and high schools in this city and staying here to invest…” Trotter goes on “I’ve got a lot of friends in this area who are entrepreneurs and business owners…” Check out the entire 3 minute interview below. With the everywhereelse.co conference just over two months away, over 1500 people have already purchased tickets from across the country and around the world, to come to Memphis and see this wind of change with their own eyes. Hundreds of those attendees have identified themselves as accredited angel investors and VC’s and out of the companies we recognize there is over $10 billion dollars in venture capital that will be represented at the conference. With that it’s only fitting that we’ll kick off the festivities of Sunday evening with a Grizzlies game as they take on the Minnesota Timberwolves on Sunday February 10th when they arrive for the conference. After the game all the attendees will pour onto Beale Street to take in some of the entertainment that Memphis is famous for during the Grasshopper, the Entrepreneurs’ Phone System Bar Hop. And go ahead check out the Memphis Grizzlies.